Staple Hearthstone cards we'll miss most in the upcoming Rise of Shadows rotation – AiPT! Hearthstone‘s latest expansion, Rise of Shadows, releases on April 9th — which means a slew of staple cards we’ve grown accustomed to in the Year of the Mammoth are rotating out of Standard and into the Wild. The following are some of our favorites that’ll leave some huge deckslots to fill in the coming Year of the Dragon. The jungles of Un’Goro will be a little less safe without this stalwart, slow value Tortollan guarding the way. The overall public minion of the rare minion was somewhat soured by Paladin class Taunt discovery rates (You go to hell, Sunkeeper Tarim) but Stonehill was nonetheless a crucial 3-drop in myriad decks. Some interesting notes: 2nd most played neutral card played in the Year of the Mammoth (in 22-24% of all decks); sported a 54.6% winrate; benefited all classes and never felt oppressive. Overall, a healthy, well-designed card for the competitive meta. A staple of Hunter decks, this electrifying raptor had the powerful ability to Adapt a friendly Beast upon entering the battlefield. 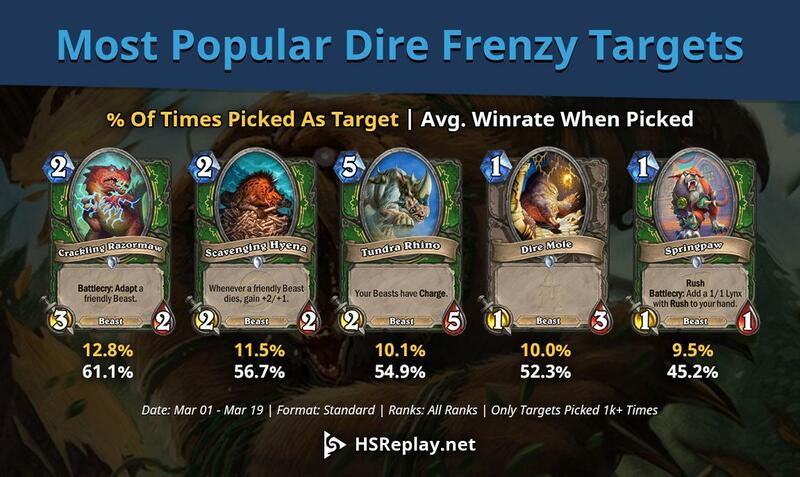 Being a Bloodfen Raptor whose Battlecry was able to gift a minion with Windfury, +3 Attack or Poisonous depending on the game’s situation was crucial and attributed to Razormaw’s standing as the most popular Dire Frenzy target (according to HSReplay, 12.8%). Turn two for Hunters has big claws to fill with Razormaw on its way out in Year of the Dragon. Although Team 5 rotating these two cards out a season early is evidence that even they themselves considered the two cards as overbearing to the meta (they were two of nine cards to hit the Hall of Fame this past year) their effect on the game, the strategies they promoted (or lack of strategy, some might say for Baku Paladin) and their popularity on the Ranked Ladder were undeniable. Utilizing only Odd and Even cards breathed new life into old faces that hadn’t seen the light of day for some time (Frostwolf Warlord and Raid Leader are two which come to mind for Odd). As Team 5 themselves said however, “Baku and Genn are powerful cards that have promoted new strategies since their introduction in the metagame. Those strategies have been more prevalent than we’d intended in Standard, and we felt that they might end up overshadowing what we’re going to introduce in the Year of the Dragon,” and we’re never ones to disagree with the meta being adjusted in order to freshen things up. Much like Stonehill Defender, Tar Creeper became a staple card in myriad decks from aggro to midrange to control, despite its Taunt minion status. As of this writing, the card is the third-most-included card in the pre-Rise of Shadows meta, with 23.5% of all decks including the powerful Journey to Un’Goro common Taunt minion. Because of the card’s alternating Attack Power (having only 1 Attack on the controlling player’s turn) the card never felt broken, though it could be a very sticky minion for those not equipped or ready to handle it. Tar Creeper is another card whose full art we dig a lot — the concept of a sentient tar monster with the bones of primordial beasts lodged in its viscous upper back is just plain fun. Cause slayers gonna slay, slay, slay, slay, slay. A must-include card for any Rogue deck; while Assassination was a decent-enough Combo card for the class, the fact Vilespine provides a ¾ body in addition to the effect makes it a noticeable improvement. Rogue will still have Walk the Plank when Vilespine rotates out but it’s not quite the tempo swing Vilespine was; the epic Rogue minion will be sorely missed in Rise of Shadows. This might be the most divisive inclusion on the list due to many who consider Carnivorous Cube overpowered, but a necessary one nonetheless. Cube’s Deathrattle activator, which summons two copies of the minion it killed, along with a 4/6 body for a reasonable 5-mana makes it an extremely high-value card. Cube Warlock was one of the most popular decks in the Kobolds & Catacombs and early Witchwood metas. The deck had great consistency, with many of their cards serving multiple purposes and few ways to ‘whiff’. Deathrattle synergies worked on both Possessed Lackey and Carnivorous Cube, and the Cube could be used as a deathrattle trigger itself. Demons could be summoned from both the deck or hand by Possessed Lackey and Skull of the Man’ari respectively, preventing drawn demons from being dead cards. The deck also boasted incredible healing from Lesser Amethyst Spellstone, Bloodreaver Gul’dan’s hero power, and Dark Pact itself. Players often had little to no counterplay or answer against Cubelocks, as the warlock could target their high-value demons with Carnivorous Cubes immediately and then activate the deathrattle within the same turn, giving the opponent no time to silence or destroy their threats. The primary reason we’ll miss Cube however though is because even though its card effect may have been a bit too valuable in retrospect, it was a very unique and singular experience piloting a Cube deck, at least before it became played out. Though Dark Pact (went from restoring 8 health to 4) and Possessed Lackey (went from 5-mana to 6-mana cost) were nerfed to quell Cubelock’s dominance, the deck has still remained viable in competitive play, usually cropping up as a second tier deck from time to time since its initial fall from the top. Other popular decks Carnivorous Cube has served as the linchpin for are Deathrattle Hunter and Deathrattle Rogue, the former which was a top tier deck for much of the latter portion of the pre-Year of the Dragon meta. A cleverly designed, cheap card from the Knights of the Frozen Throne expansion with devastating potential, Defile served as a much-needed board clear against Jade Golem decks during its inception and a must-include for all non-aggro Warlock decks thereafter. 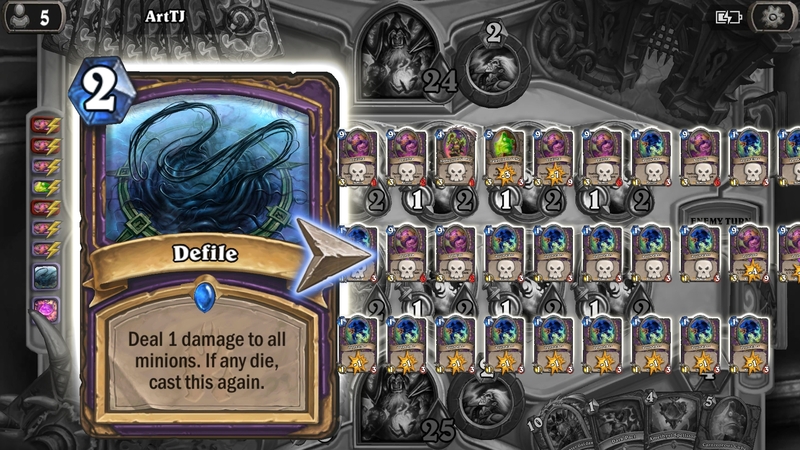 When properly played, Defile could pull off clears that were calculating, overwhelmingly satisfying, extra ostentatious and mind-blowingly epic all at once. How the Warlock class will replace such a crucial AOE remains to be seen — Defile may be one of our most missed cards of all time when all is said and done. When this card was first revealed before the release of Kobolds & Catacombs, we thought it had the potential to be one of the most powerful Hearthstone cards ever printed. While that may have been a bit of an embellishment, Duskbreaker is still a Warlock Hellfire plus a free 3/3 body, which makes it extremely powerful — even in Priest decks that didn’t have Dragons as the main focus. 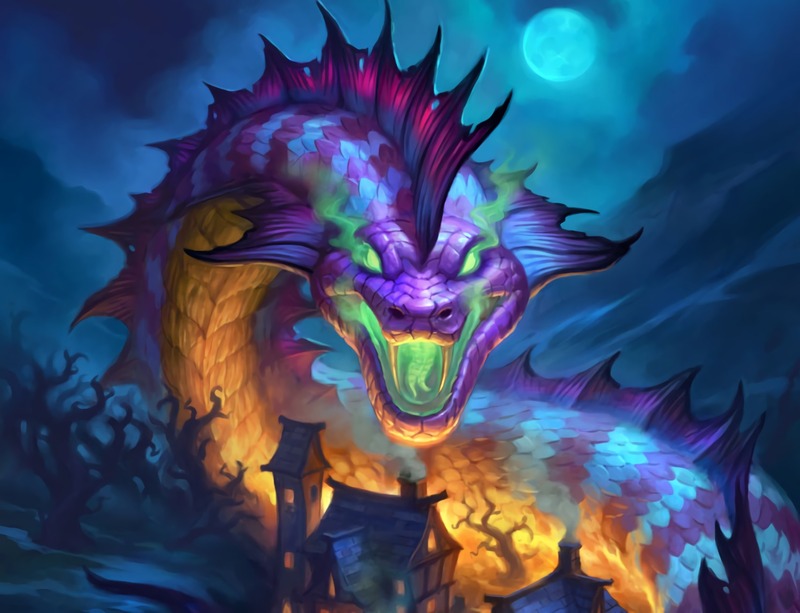 Plus, Duskbreaker’s card art is one of our favorites with its high-fantasy depiction of an enormous, scaly twilight drake blowing beautiful, deadly purple-pink flames from its mouth. The composition, lighting and the dragon’s frightening appearance are beautiful. Props to artist Alex Horley. The most-included non-Legendary card in the Year of the Raven (in 24.3% of decks). A 1-drop that was overall 2 mana for a flexible 2/4 of stats spread over two bodies. A minion that fulfilled different synergies for each class (Combo activator for Rogues, cheap Elemental tribe activator for Shaman/Mage, best 1-drop for nearly everything else and a staple of Baku decks). We salute you, Fire Fly, perhaps the best designed and certainly the most solid 1-drop since Naxxramas’ Haunted Creeper. Honorable Mentions: Dire Mole, Death Knight Hero cards. Which card rotating out before Hearthstone‘s Rise of Shadows will you most sorely miss? Let us know in the comments. All statistical data courtesy of HSReplay.net.